The third issue tackled by the 2018 Community Consultation on the Future of Global Voices was Organizational Structure. 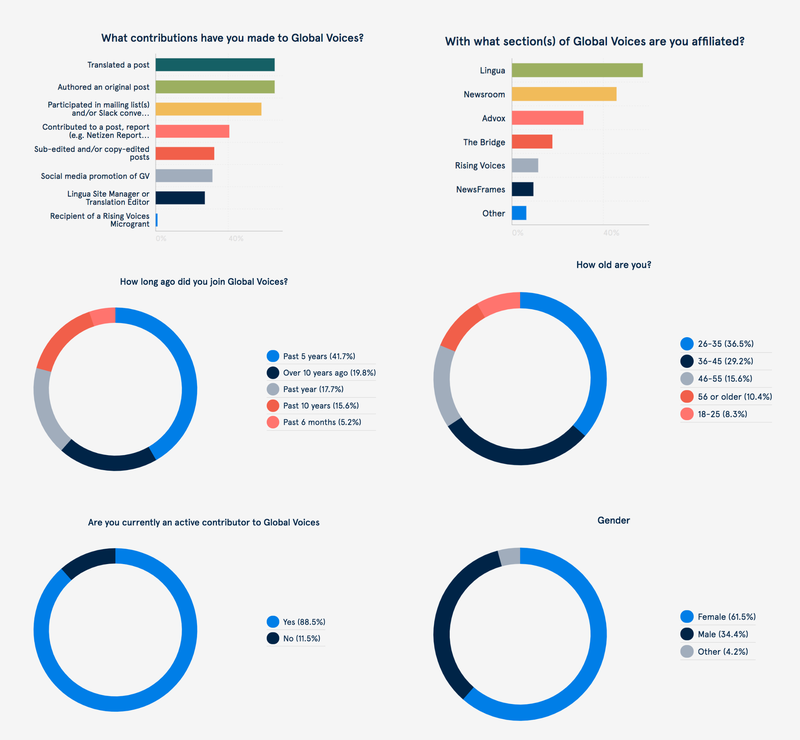 In this poll, we consider the question of decision-making and authority within Global Voices. We ask, should we decentralize decision-making and governance, or should we centralize it further? 1 Which of these elements are most important in a future GV organizational structure? 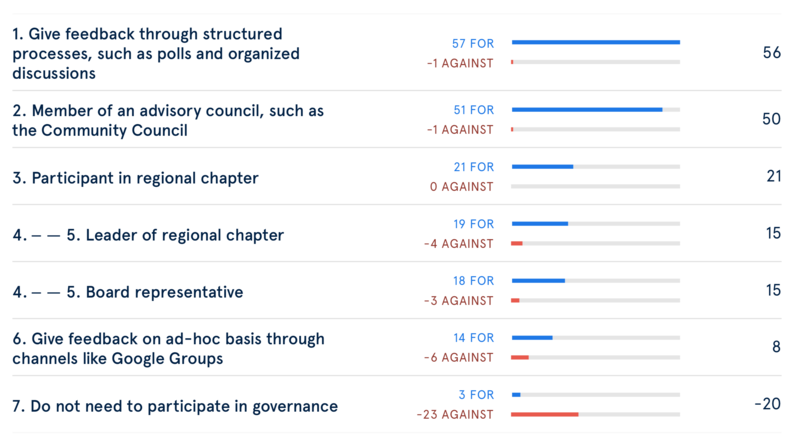 2 What activities would you support being organized at the regional level? 3 When you consider giving greater autonomy to sub-groups within GV, what is most important to you? 4 What decision-making processes would best serve GV’s mission and goals? 5 How would you personally like to participate in governance? 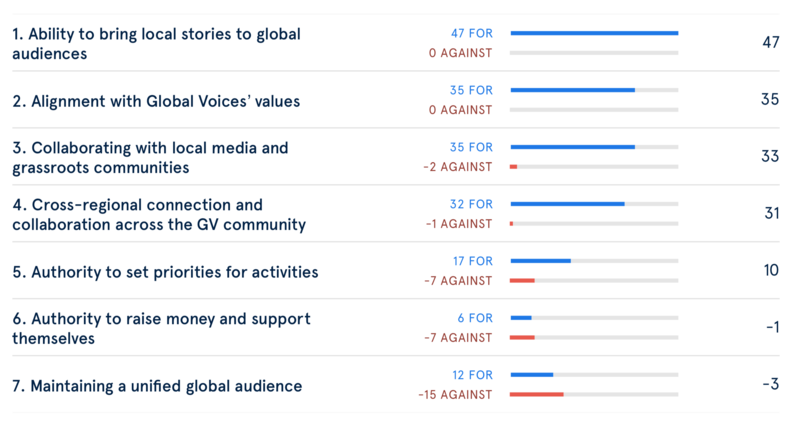 6 Which model of participation in Global Voices most appeals to you? Members of the council were encouraged to read the issue paper and discuss it on our private mailing list, which received many long, thoughtful replies on the subject. We also held two group video chats where the issues were discussed. This page serves as an archive for the results of the D21 poll that finished our deliberation on this issue. You can review the full poll results for Issue #3 right on the D21 platform. You can also download the results for Issue #3 as a PDF. 96 council members voted in this poll. The results for each poll question are shown below. Each voter was able to use both “for” and “against” votes, to indicate which options they were most and least in favor of. The results allow us to see both what is popular and what is controversial. Which of these elements are most important in a future GV organizational structure? 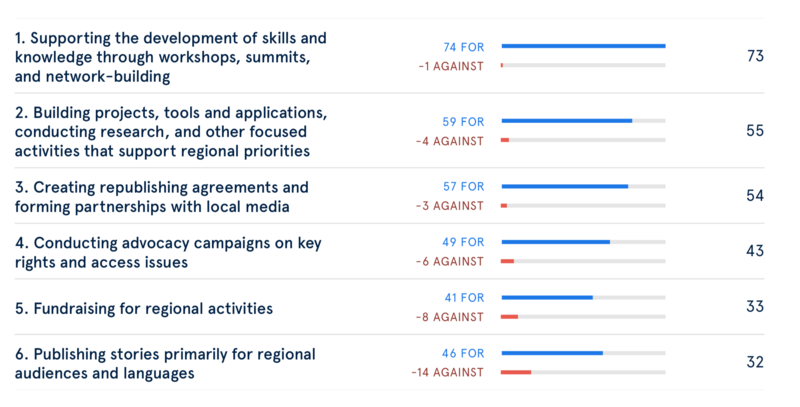 What activities would you support being organized at the regional level? When you consider giving greater autonomy to sub-groups within GV, what is most important to you? What decision-making processes would best serve GV’s mission and goals? How would you personally like to participate in governance? Which model of participation in Global Voices most appeals to you?